Amidst a handful of completely boring posts about developments in Mueller’s investigation into Russian interference with the 2016 presidential elections, fans of the man friends called “Bobby Three Sticks” (it’s a deep cut for Muel-herders; don’t worry about it) delight in creating memes and extolling the virtues of their hero. 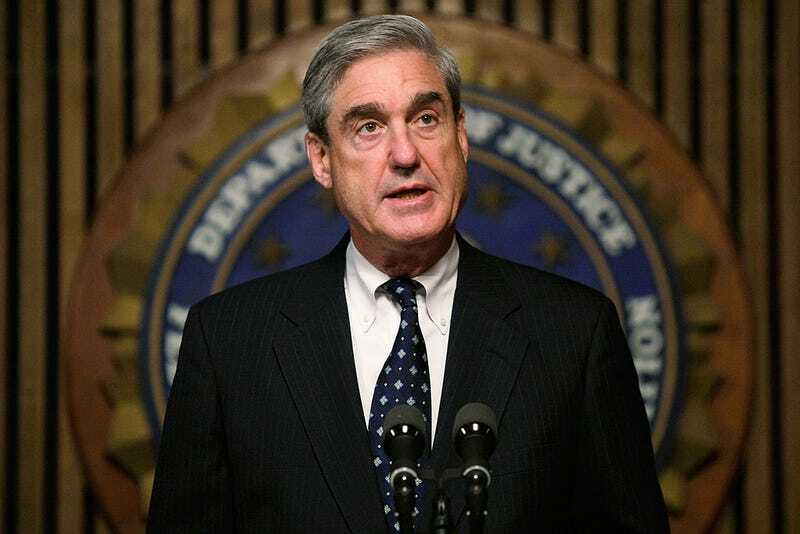 Here, for example, is a photoshopped GIF of Mueller as The Wire’s Omar, cleverly captioned “Mueller comin’, yo!” Continuing on the anti-hero theme, here’s a post that compares our man’s thirst for justice to that of classic cinematic hero . . . The Texas Chain Saw Massacre’s Leatherface. Enjoy, too, fan casting for the inevitable biopic (personally, Orlando Bloom seems like a better choice) and, of course, the expected The Matrix and The Lord of the Rings memes. As much fun as the subreddit is (and it is a lot of fun), it’s not surprising that so many, desperate for any hope of a Trump impeachment, would turn Mueller into an object of worship. People need to grab onto whatever rays of sunshine they can find. If doing so involves copy and pasting politican’s heads onto blurry images, go with god.